Take aim and fire all these targets like Robin Hood. Sometimes the targets are villains and criminals, with a big bulls'eye on their chest! Gibbets is back with an all new expanded Level Pack featuring 48 all new, harder and funner then ever challenges. Take aim and save the day! Get to the hang men before the vultures do! Ready, aim, fun! Fire off hungry little iZZi's at the colored blocks and watch them eat them up! This physics based cannon puzzler features hungry smileys that love to eat different colored blocks. Perfect your tennis skills with Tennis Master! A funny cat verse dog beach game were you try and bop the other player on the head with sea shells how funny! 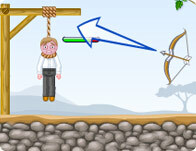 A point based archery simulation game. Try to hit the center to earn bonus points for accuracy! Connect the dots and make Christmas figures with Santa's pee-power! Complete various challenges and an exciting campaign mode with 12 unique bows and 3 awesome crossbows. Shoot 50 targets as quickly as you can.